You can find lots of Magento 2 gift card extensions in the ecosystem. For instance, there are reliable solutions developed by Amasty, aheadWorks, and Mageworx that are all reviewed on our blog. 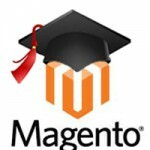 Today we explore the Magento 2 Gift Card extension by Magestore. 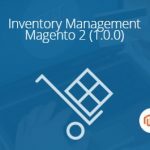 The solution adds a certificate system to a Magento 2 website so that your customers can buy and send gift cards to their friends. The Magestore Gift Card Magento 2 extension provides 4 different gift card templates by default, as well as the Amazon Gift Card template. As a store administrator, you can create an unlimited number of gift cards with different values. The module allows you to use fixed prices, price ranges, or drop-downs as a gift card value. It is also necessary to mention that the extension allows you to display gift card usage conditions before a customer makes a purchase decision. Another great feature of the Magestore Gift Card Magento 2 module is its notification system. When a recipient receives a card, a sender gets an email notification. Moreover, a gift card can be sent anonymously! 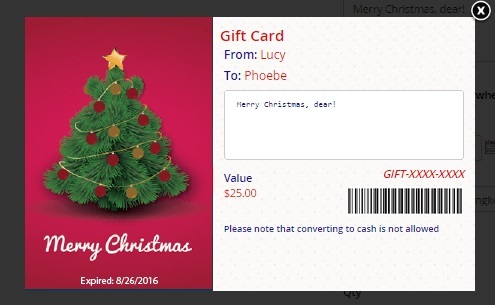 Besides, buyers can upload their images and add custom messages to gift cards. Note that a gift card actual value can be equal or greater than its price. There is also a scheduling system that lets buyers send cards on specific dates. Both email and post office delivery is possible (we hope you love forests, so the second option will not be even considered). Furthermore, you can allow multiple people using a gift code, as well as use them during checkout as a discount method. A buyer can check and manage gift cards in his or her customer account. It is also possible to check gift card information without logging into the account. 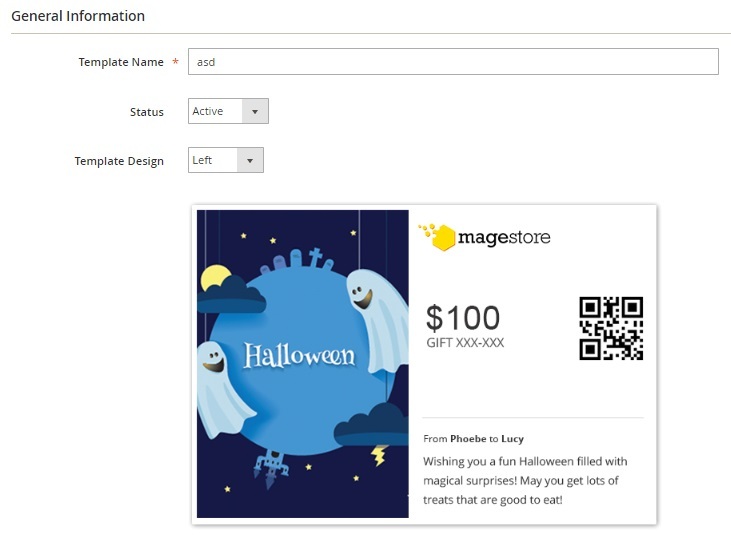 In case Magestore Gift Card conflicts with your template (though it is almost impossible), you can get rapid support and a practical solution to all problems. Now, after we described the core frontend functionality of the Magestore Gift Card Magento 2 extension, let’s dive deeper into its backend. Let’s explore how to add a new gift card. 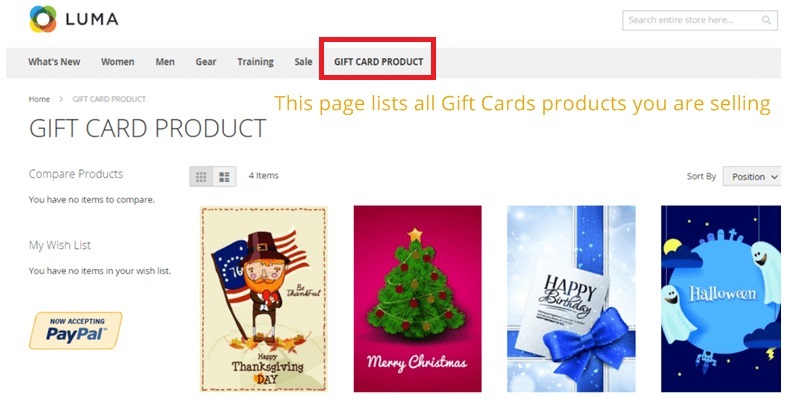 Hit Add Gift Card Product on the Gift Card Product Manager page. 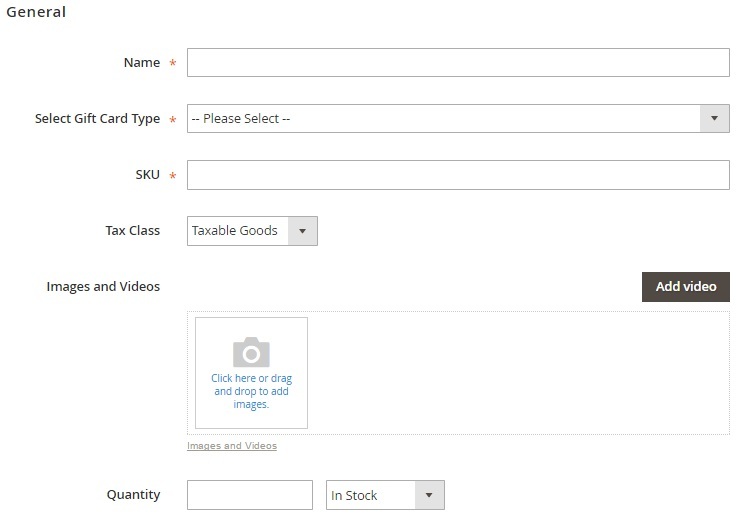 You will be transferred to a new product page with basic and advanced settings. 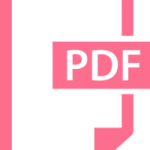 Both sections do not provide many new fields in comparison to other products. 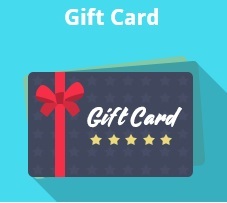 Thus, on the General tab, you should specify a gift card name, type (virtual, physical, or combined), SKU, and tax class; choose images and videos, add quantity, specify whether the product has a weight or not, enter a category (you can add a new one here), add a description, and select gift card templates and code sets. It is also necessary to draw your attention to the Advanced Pricing tab from advanced settings. 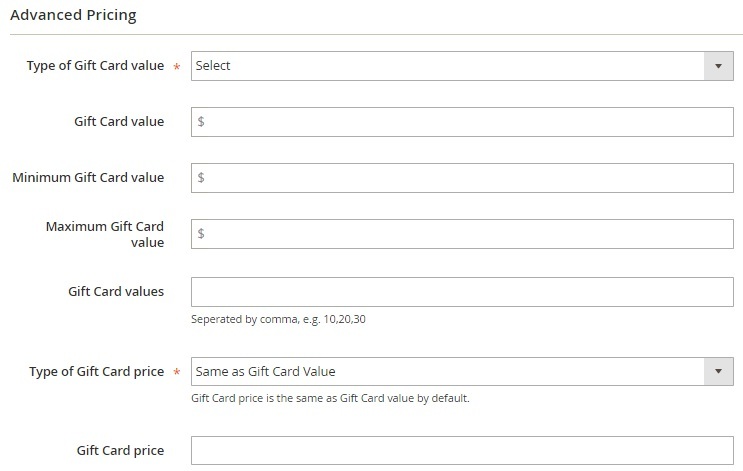 Here, you select a gift card value type (fixed value, a range of values, or drop-down values). Depending on a selected type, you should specify gift card value, minimum and maximum values, or gift card values. As for gift card price types, they are Same as Gift Card Value, Fixed Price, and Percent of Gift Card Value. Next, you specify the necessary value in the Gift Card Price value. All code settings are divided into 4 tabs: General Information, Shopping Cart Conditions, Cart Item Conditions, and Message Information. The first one allows you to specify a gift code pattern, value, currency, template, status, expiry, store view, and comments. 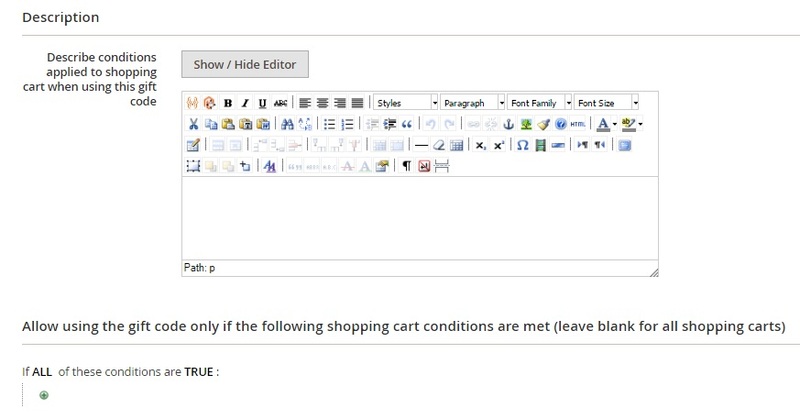 The second section allows you to create shopping cart conditions and add a description for them. With the help of the Cart Item Conditions tab, you can make a new gift code more precise. In Message Information, specify customer and recipient name and email, add a shipping address, and leave a message. As for gift code sets, they can be imported. The appropriate grid shows ID, name, and quantity of each code set. A similar manager is used for gift card templates, but you cannot export templates and get an additional mass action – change status. 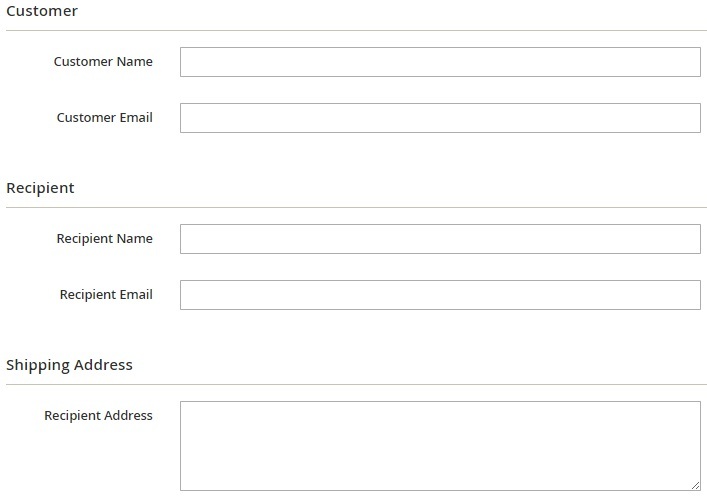 As for the grid columns, they are: Checkbox, ID, Template Name, Template Design, Status, and Action. While editing a pattern, you can change its name, status, template design (left, top, or center), and style and text colors. Besides, it is possible to add images in the Images section. 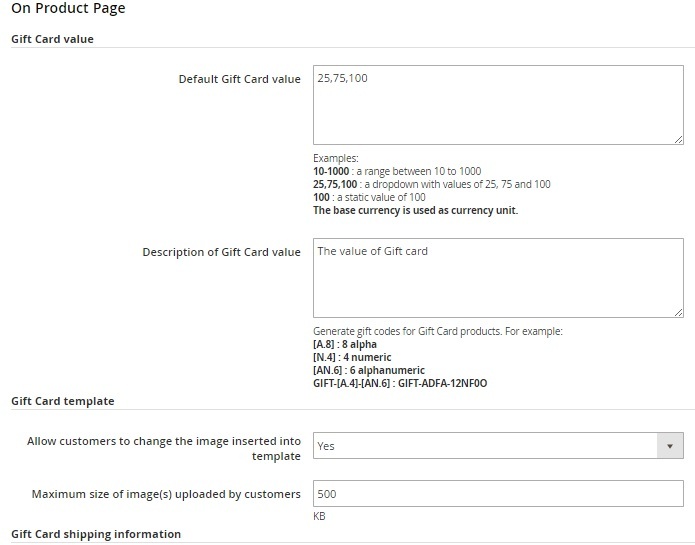 There is also a history tab that shows gift card creation date, an action performed with a card, card value, currency, status, corresponding order, and a customer who made the action. 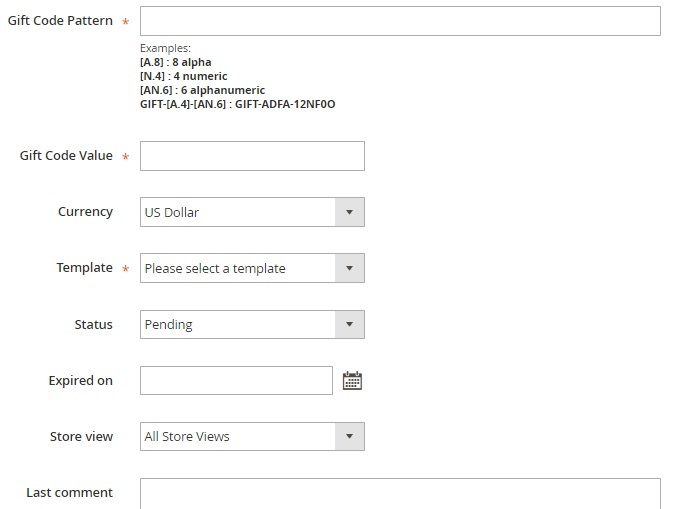 All settings of the Magestore Gift Card Magento 2 extensions are divided into 6 blocks: General, On Product Page, On Shopping Cart Page, On Checkout Page, Email Notification, and Gift Card Print Out. 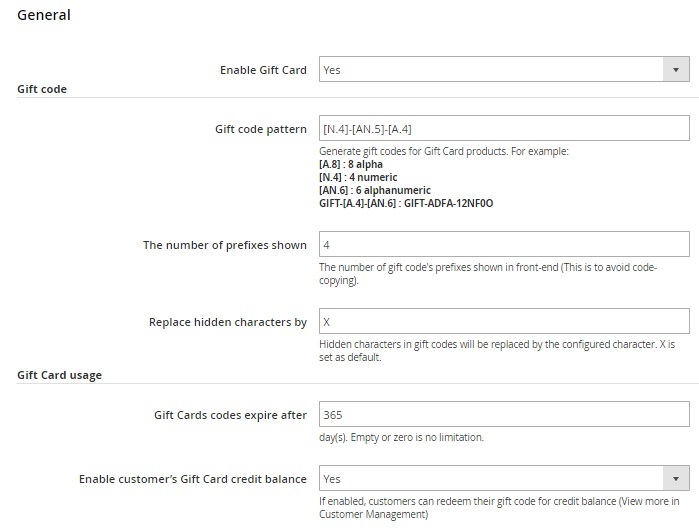 The General block allows you to enable/disable the extension, configure gift codes, customize gift card usage, and choose a tax configuration. The On Product Page block lets you specify default gift card values and add their description. 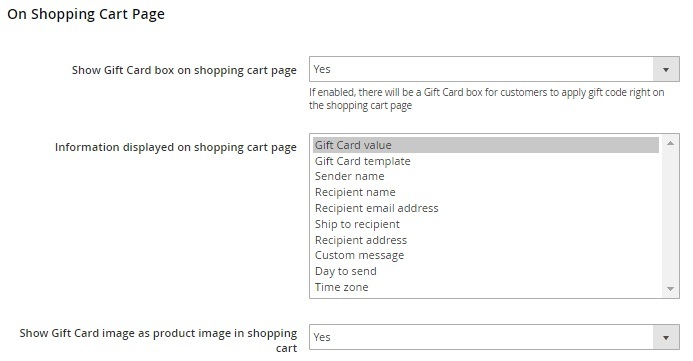 Next, you can activate the display of the Gift Card box on a shopping cart page, choose which information to display there, and decide whether to show gift card images as product images in a cart or not. Then, select whether to show the Gift Card box on a checkout page. You can also fine-tune the notification system of the extension. 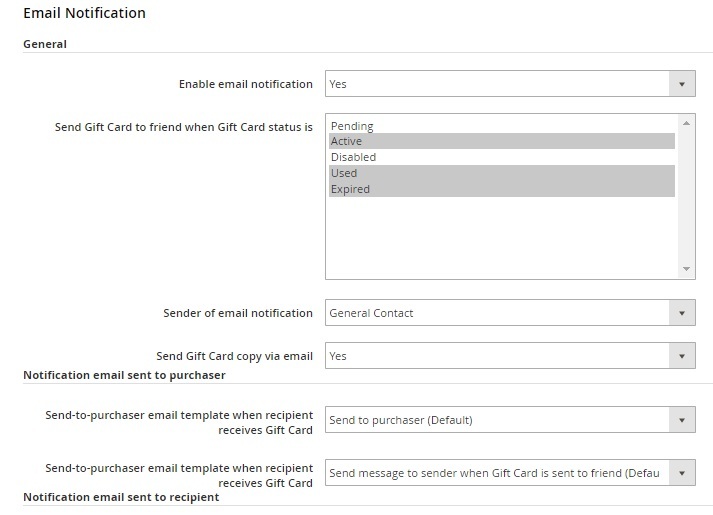 It is even possible to configure purchaser and recipient email notification settings. 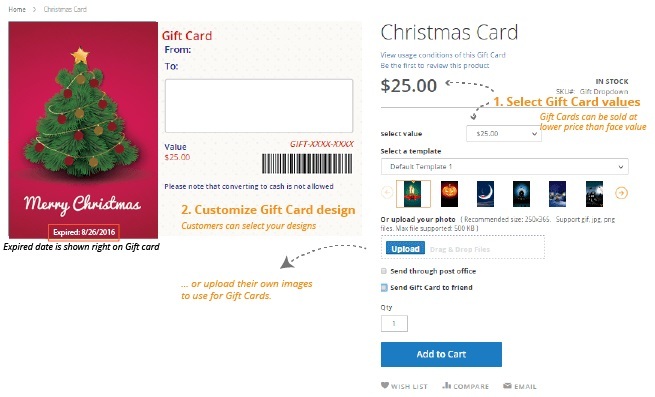 In Gift Card Printouts, you can upload a logo and activate using barcodes on gift cards. The Magestore Gift Card Magento 2 module is in our list of reliable gift card extensions along with the other solutions mentioned above. It is fast, user-friendly, and multifunctional. Also, check Magento 2 Gift Card Extensions Comparison – we describe core Magento 2 gift card modules there. 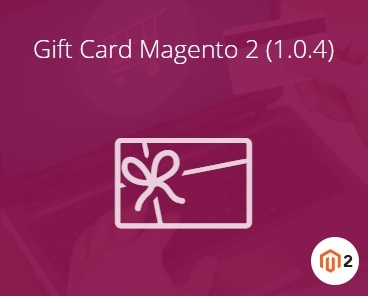 Below, you can still find the description of the Mageworx Gift Card Magento 2 extension.